GROW is an automated solution to evaluate job candidates, developed by Tokyo-based people analytics startup, Institution for a Global Society (IGS). GROW was developed with the idea that the hiring process is often a missed opportunity to collect, utilize and exchange feedback that could change people’s behaviors for the better. The solution has developed into a tool that both helps students to understand their strengths and weaknesses, while at the same time assists HR in hiring based on competencies and personality traits. GROW uses artificial intelligence learning algorithms to analyze assessment data from both candidates and evaluators, looking for patterns to improve its ability to accurately screen candidates over time. In place of human intuition, GROW uses big data to develop a scientific, objective, and constantly-improving engine to recruit, screen, and develop human capital. As of September 2017, GROW has 100,000 student users, and clients including Mitsubishi Corporation, All-Nippon Airways (ANA), Septeni, DeNA, Rakuten, AXA, as well as government entities such as Japan’s Ministry of Economy, Trade, & Industry, and the UAE. GROW has received various prestigious awards including the HR Solution Silver Prize and the HR Tech Innovation Award in Japan. In his presentation, Founder and CEO of IGS, Masahiro Fukuhara will speak about founding IGS, developing GROW, and the opportunities and challenges that its widespread interest has presented. 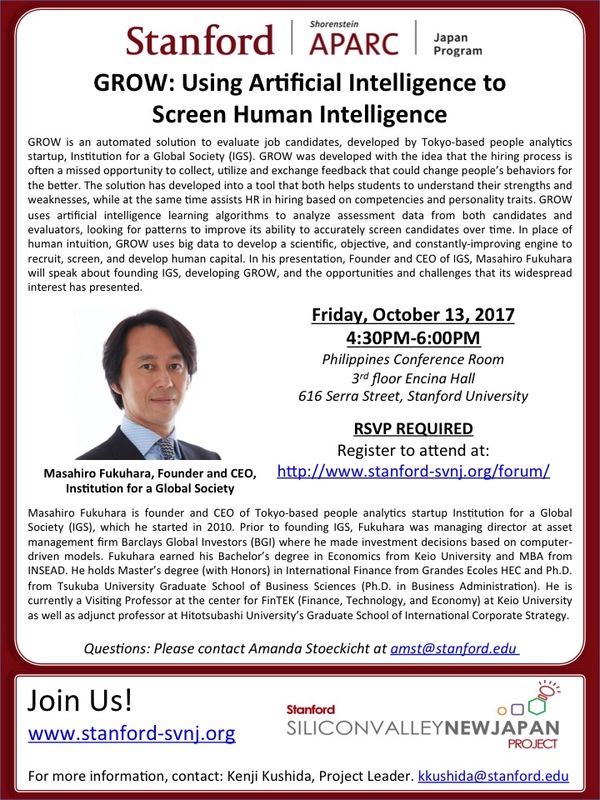 Masahiro Fukuhara is founder and CEO of Tokyo-based people analytics startup Institution for a Global Society (IGS), which he started in 2010. Prior to founding IGS, Fukuhara was managing director at asset management firm Barclays Global Investors (BGI) where he made investment decisions based on computer-driven models. Fukuhara earned his Bachelor’s degree in Economics from Keio University and MBA from INSEAD. He holds a Master’s degree (with Honors) in International Finance from Grandes Ecoles HEC and Ph.D. from Tsukuba University Graduate School of Business Sciences (Ph.D. in Business Administration). He is currently a Visiting Professor at the center for FinTEK (Finance, Technology, and Economy) at Keio University as well as adjunct professor at Hitotsubashi University’s Graduate School of International Corporate Strategy. IMPORTANT PARKING NOTE: This event is taking place during Stanford University's Homecoming Weekend. The parking slots in front of Encina Hall will not be available that day, and there may be higher demand than usual for parking on campus. Please take that into consideration when planning your travel. Thank you for your RSVP; we look forward to seeing you on 10/13.